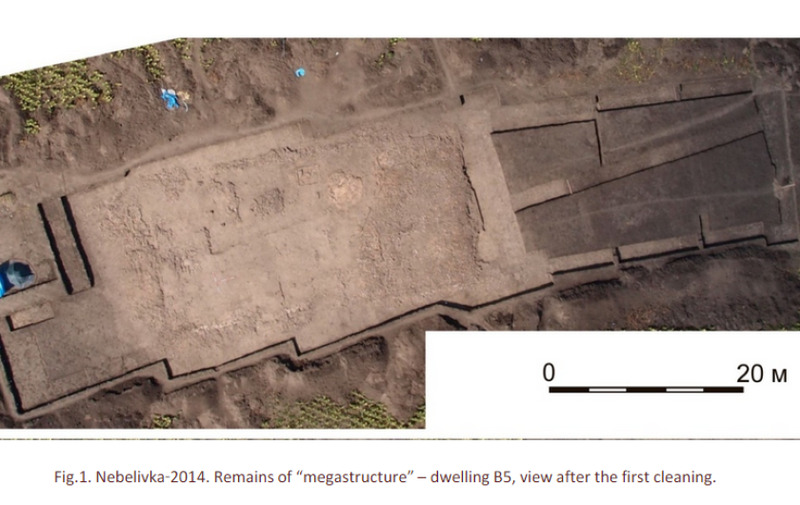 Archaeologists in Ukraine have unearthed a 6,000-year-old temple site near the ancient settlement of Nebelivka, roughly 160 miles south of Kiev, by digging up a 60-by-21-meter site believed to be one of the oldest "mega-structures" in human history. Sci-News reports that the ancient site belonged to the Trypillian culture, which lasted from approximately 5,400-2,700 B.C. and extended from the Carpathian piedmont to the Black Sea. The culture was complex, boasting early advancements in metallurgy, pottery and textiles. According to researcher Mikhail Videyko, the temple was likely two stories tall, the largest of its kind on the site, and may have been the "center of a complex plan" as the "central temple of the whole village community." Each single-habitation Trypillian settlement appears to have been burnt to the ground after about 60 to 80 years of continuous occupation for reasons unknown to current researchers, including the temple site. "The temple was a two-story building made of wood and clay surrounded by a galleried courtyard, five rooms were on the first floor and raised family altars made of clay were on the ground floor," Videyko wrote. "Its construction required labor commensurate with the construction of several dozen ordinary houses. Its plan and some features of this structure find analogies in temples from the 5th to 4th millennia B.C. known from excavations in Anatolia and Mesopotamia." While the main structure appears to have mostly consisted of various clay, the researchers found additional signs of wooden support structures. The discovery has also drawn attention because some experts theorize Trypillian society was matriarchal, in part due to the large number of female figurines found at dig sites. Sci-News explains that the culture involved "women heading the household, doing agricultural work and manufacturing pottery, textiles and clothing. Hunting, keeping domestic animals and making tools were the responsibilities of the men." However, there isn't a great deal of hard evidence suggesting which gender held predominant roles in Trypillian culture. In the meantime, marvel at the fact that cultural artifacts six millennia old are still intact enough to be pored over by scholars today.